I’m glad that Donald Trump wants faster growth. The American people shouldn’t have to settle for the kind of anemic economic performance that the nation endured during the Obama years. But does he understand the right recipe for prosperity? That’s an open question. At times, Trump makes Obama-style arguments about the Keynesian elixir of government infrastructure spending. But at other times, he talks about lowering taxes and reducing the burden of red tape. I don’t know what’s he’s ultimately going to decide, but, as the late Yogi Berra might say, the debate over “stimulus” is deja vu all over again. Supporters of Keynesianism (a.k.a., the economic version of a perpetual motion machine) want us to believe that government can make the country more prosperous with a borrow-and-spend agenda. At the risk of understatement, I disagree with that free-lunch ideology. And I discussed this issue in a recent France24 appearance. I was on via satellite, so there was an awkward delay in my responses, but I hopefully made clear that real stimulus is generated by policies that make government smaller and unleash the private sector. If you want background data on labor-force participation and younger workers, click here. And if you want more information about unions and public policy, click here. For today, though, I want to focus on Keynesian economics and the best way to “stimulate” growth. The question I always ask my Keynesian friends is to provide a success story. I don’t even ask for a bunch of good examples (like I provide when explaining how spending restraint yields good results). All I ask is that they show one nation, anywhere in the world, at any point in history, where the borrow-and-spend approach produced a good economy. Simply stated, there are success stories. And the reason they don’t exist is because Keynesian economics doesn’t work. Though the Keynesians invariably respond with the rather lame argument that their spending schemes mitigated bad outcomes. And they even assert that good outcomes would have been achieved if only there was even more spending. All this is based, by the way, on Keynesian models that are designed to show that more spending generates growth. I’m not joking. That’s literally their idea of evidence. Since you’re probably laughing after reading that, let’s close with a bit of explicit Keynesian-themed humor. 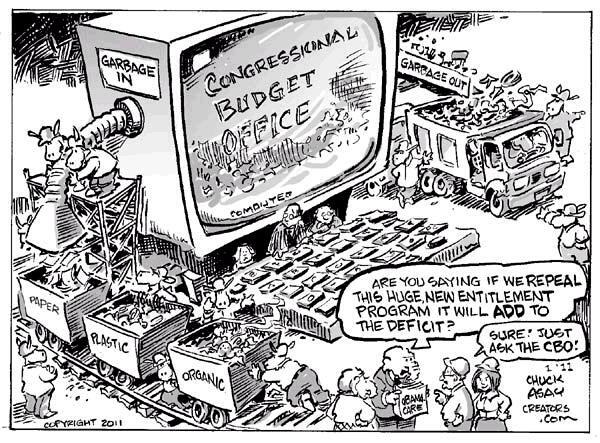 I’ve always thought this Scott Stantis cartoon best captures why Keynesian economics is misguided. Simply stated, it’s silly to think that the private sector is going to perform better if politicians are increasing the burden of government spending. But I’m also amused by cartoons that expose the fact that Keynesian economics is based on the notion that you can become richer by redistributing money within an economy. Sort of like taking money out of your right pocket and putting it in your left pocket and thinking that you now have more money. Expanding on this theme, here’s a new addition for our collection of Keynesian humor. 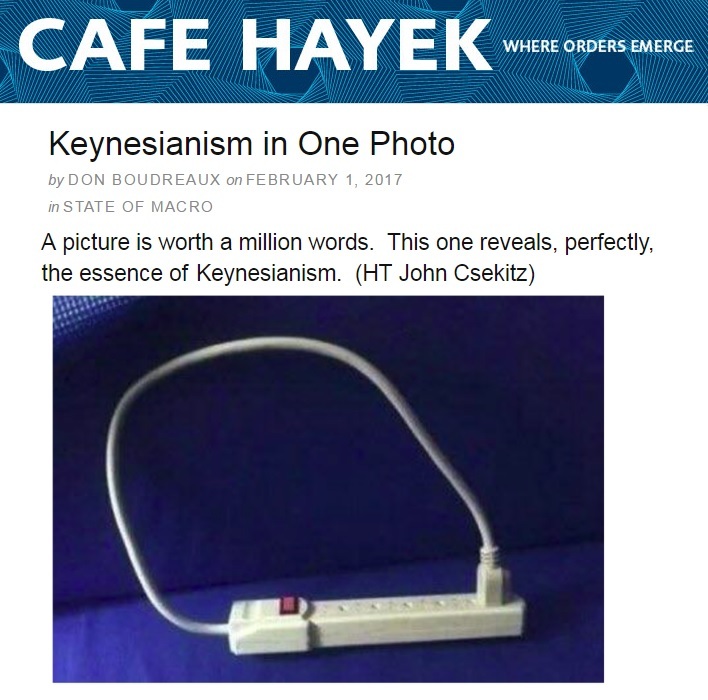 It’s courtesy of Don Boudreaux at Cafe Hayek, and it shows the Keynesian plan to charge the economy (pun intended). You don’t need to know a lot about electricity to realize this isn’t a very practical approach. Is this an unfair jab? Maybe, but don’t forget that Keynesians are the folks who think it’s good for growth to pay people to dig holes and then pay them to fill the holes. Or, in Krugman’s case, to hope for alien attacks. No wonder it’s so easy to mock them. P.S. If you want to learn more about Keynesian economics, the video I narrated for the Center for Freedom and Prosperity is a good place to start. P.P.S. And if you like Keynesian videos, here’s the famous video showing the Keynes v. Hayek rap contest, followed by the equally entertaining sequel, which features a boxing match between Keynes and Hayek. And even though it’s no longer the right time of year, here’s the satirical commercial for Keynesian Christmas carols.